Katie Kelsoe has verbally committed to the Alabama Crimson Tide. The Minnesota Golden Gophers have a verbal commitment from breaststroker Katelyn Sauder, who will join their roster next fall. Rachel Kelch (green cap) has verbally committed to the Western Kentucky Hilltoppers. Junior Nationals finalist Justin Ress has made a verbal commitment to join the Wolfpack for the 2015-16 season. 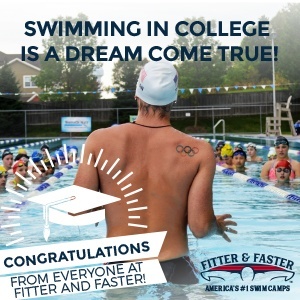 Cody Bekemeyer of SwimAtlanta will be a Gamecock next fall. Kansas City Blazers butterflyer Rilye Fries has verbally committed to swim for the University of Nebraska next season. The Stanford Cardinal received a verbal commitment from Southern California sprint freestyler Kaitlyn Albertoli. Butterflier and IMer Bailey Nero from Fort Collins, Colorado (shown here with her parents), has committed to the Auburn Tigers. Delaware Swim Team distance star Robbie Dickson has committed to Penn State for the 2015-16 season.